Just back from holiday with internet intermittent at best so loads to catch up on. (You've all been very busy). With KM recycling old outfits because Charles won't foot the bill for a layabout in KM, do you think this might be happening now to MM? Maybe because he doesn't approve of her? That's why her shoes are too big. She's still having to get freebies. But many of the outfits showcased by the new Royal since her engagement in December are not so purse-friendly. A click bait article if I ever saw one. The DM outdid even themselves. How do they know what she paid. Charles can't be mean to Meghan and undo the good PR he got from escorting her down the aisle. Charles is image conscious IMO. The United States Internal Revenue Service appreciates your assistance with their research, DM. ^But, Kate isn’t a US citizen under our tax laws, is she and not really the topic here, either. I don't believe that any Royal pays any quoted price for items of clothing. I think there are huge discounts involved each time, with perhaps as much as a half taken off the price charged other customers. Nor do I believe that dress designers release the prices of their garments to newspapers, especially tabloids. And that goes for purveyors of shoes, jewellery and other accessories. And some items during the engagement period would have been loans. What's more, I don't think it would be Charles ponying up for clothing during the engagement. He isn't that generous. Like his other daughter in law his remit for Meghan began on the wedding day for official duties outfits only. Weren't the royals supposed to not take freebies and special discounts in exchange of merching? So far we have over 1 mil for the jewels and the clothes in merely 7 months. IRS is happy, the tax payers (of which we are not) must be thrilled to have her and the only winner in all of this is Kate who has always been conscious and thrifty with her spending. This chick with her very expensive taste is ticking off the people of the commonwealth. ^^ Yes, that's the rule: the Winds have a self-imposed rule to not take freebies and always pay full price. However, we know for a fact that they do not adhere to this rule. Kate isn't at all thrifty or conscious when it comes to spending, but the PR spin is a good one and her being seen in High Street stuff on engagements as well as privately is very very good. I do think she likes the High Street stuff too, why not. In any case, it's more PR than truth that she's "thrifty" or considerate in spending. She actually a huge spendthrift and has one of the highest bills of the women. Murky has surpassed her quickly and she isn't with the heir, so double shame on her. Kate's, Cam's & Liz's spending aside, Murky's is disgraceful. I do however think much of it were freebies and that someone else paid, or M decided to raid her savings as she thinks she has a set future in the lap of luxury. Because her earnings weren't all that great, she's nowehere near the millionairess people think or make out she is. Best comment and actually literally what I thought when I saw the article!! Kate has been in the Firm since 2011. Markle just came into the Firm so she could not possibly have surpassed Kate. Kate's history has been doing as little work as possible and grabbing for the perks. I don't buy that she is thrifty with those expensive homes and her ordering new kitchens and so forth. I think her hairdressers do not come cheap. Also, when some of the outfits were purchased by Markle it was before the wedding day I doubt Charles would pay for clothing pre wedding. She has her own money and actresses do get heavy discounts to promote designers. 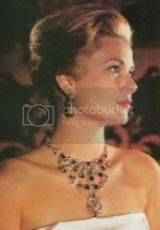 I remember some actress talking about a 6 figure diamond necklace she was wearing (borrowed). This is common practice. Meghan Markle's royal style has just swiftly led her to make history, less than eight months after she and Prince Harry announced their engagement. Meghan has just been announced a nominee for the Teen Choice Award for Choice Style Icon. This is the first time a royal has ever been considered for an award for the U.S. show that started in 1999. Should Meghan win, it'd also be a first—and fascinating to see whether she'd attend or more likely, record a video acceptance speech for the honor. While she appears to have kept it the same shade of dark brown, Jessica chopped off quite a few inches and debuted new shoulder-length hair on Instagram this weekend. 'Le change is Le good,' she wrote on Instagram, tagging her stylist Ryan Dowell in the picture. Though she didn't share more about the decision — and has generally been discrete and not given much away in interviews — the style expert has had a bit to say about her hair in the past. The response has been so big one can only imagine how much the public would talk if Meghan ever decided to go shorter. What's the point of this article? Is it to tell Meghan to take out her extensions to get more attention on her? Meghan need to stay away from the pale colours they do nothing for her jewel tones are for her. ^Good summation of her “new” look. Pretty plastic dolly. Careful,one could slip in all that grease. I think that bronzer is being used to contour, but she's got it all wrong. She looked like a wax figure at this engagement, pretty terrible. Highlighter (& blusher) were over-done and gave a very plastic look. Is she trying to be an instagram "makeup artist" or "model"? I don't particularly like the dress either, she looked underdressed for the occasion imo, and also: Prada, really?